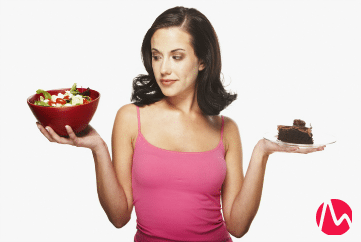 How does willpower vary across your menstrual cycle? Frustrated that, despite promises you’ve made to yourself, you sometimes still find it difficult to stick to good-for-you goals? For example, instead of opting for a fruit salad, you eat a slice of cake. Instead of keeping your cash in your pocket, you buy a cute pair of earrings. Instead of going for a jog, you order up a movie on Netflix. It’s not your fault. Truth is, your willpower is stronger on some days of your monthly cycle and weaker on others. And you have less willpower during the second half of your cycle–especially your premenstrual week. Some researchers believe it comes primarily down to two key factors: Mental fatigue and mood. When you’re mentally alert and upbeat, you’re better able to resist temptation. And it just so happens that during the first half of your cycle after your period days, high-and-rising estrogen is revving brain energy and positivity. When you’re tired and down, you’re less able to resist temptation. And during the second half of your cycle, lower estrogen and sedating progesterone are triggering brain fatigue along with a bit more negativity.